Welcome to "Part 3" of my Blog posting for the ELECTRONIC LOADING SHEET! Because a picture says a thousand words, I thought that I would make this Blog posting a photo journal showing "a day in the life of using ELS". All of the below photos were taken on January 10th, 2012 at George's Seafood in Norfolk, Virginia. George's Seafood is a "beta" customer for the ELS application. 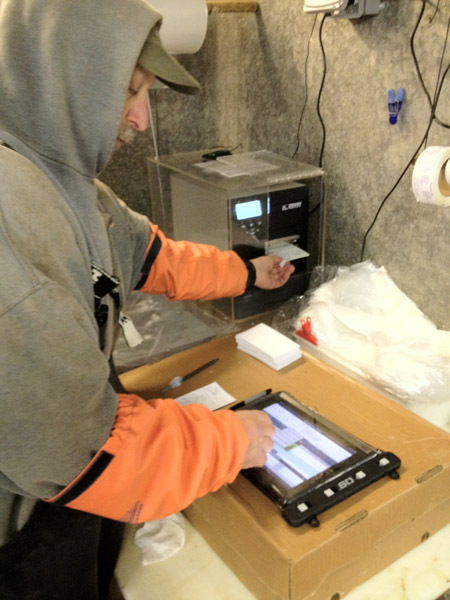 Note that as of the date this photos were taken, they are not yet utilizing barcode scanning or the Bluetooth link into their Doran scales with the ELS application. 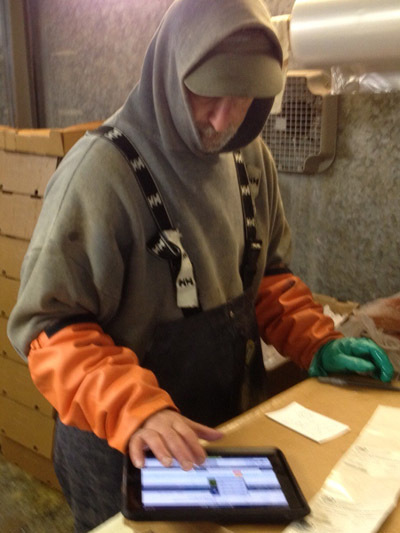 In this first picture, Richard Yavner, Production Manager in George’s Seafood’s fresh seafood division, enters weights in ELS, via an Apple iPad. 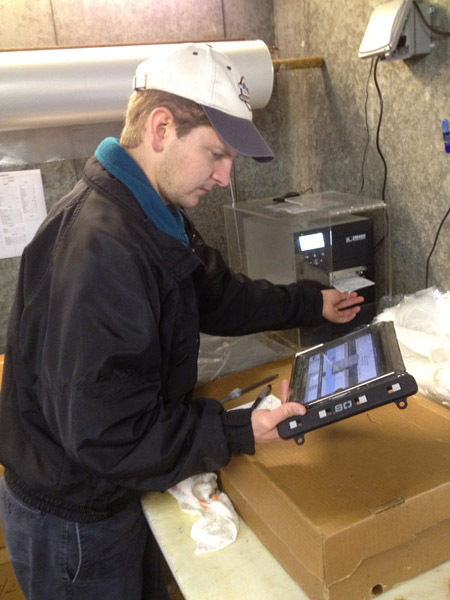 Richard loves the ease and speed of processing orders with ELS. He was happy to say goodbye to hand-writing weights on cards and transporting them to the office for data entry. 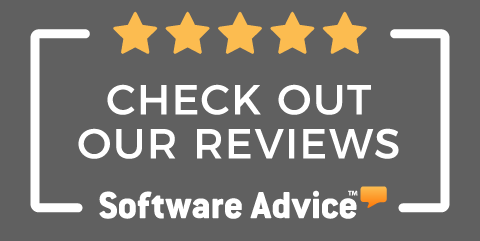 This has also eliminated a daily, high pressure task for an office employee, who in the past had to enter all the weights and shipping quantity changes for each invoice. Richard Yavner prints a label after weighting a fresh tuna loin. Labels are generated by touching the print label icon in the ELS application. Notice that the iPad is placed in a waterproof, protective case which protects the iPad from water, sand, dust, dirt and freezing temperature fluctuations. The iPad can still be easily used through the transparent front of the case. Waterproof cases like this are readily available at a cost of around $50. The printer in use is a Zebra "ZM400" thermal printer using WIFI to communicate with the network. 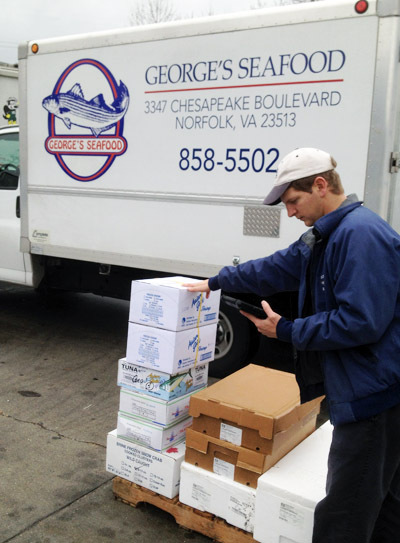 Gary John, Supervisor of Warehouse Operations for George’s Seafood, reviews open orders for daily customers and assesses processing needs. 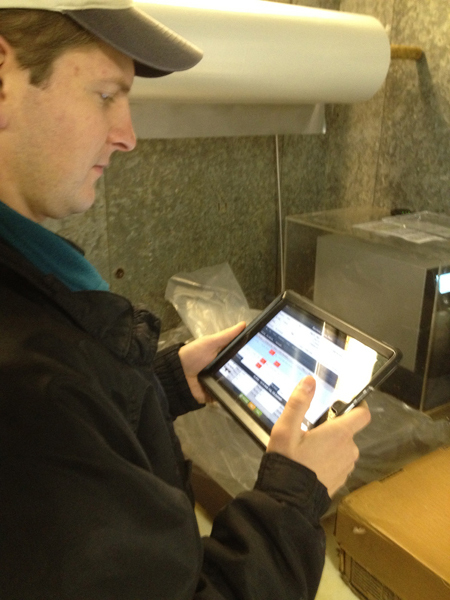 He loves the portability of ELS and the improved efficiency and accuracy in the entire warehouse operation. Gary John prints a customer shipping label, completing an open order. Customer shipping labels can be printed one at-a-time per item, by temperature zone, for catch weight items only, for non-catchweights or for all items on the customer's invoice. 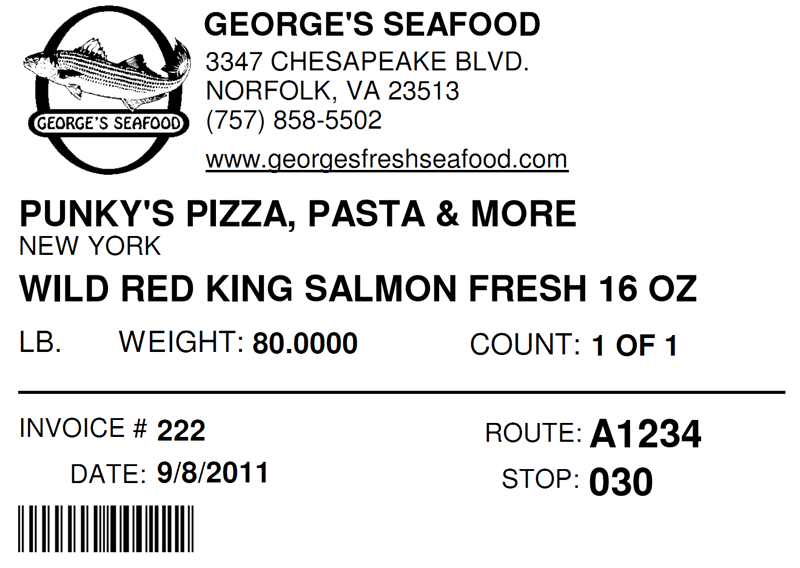 An example of George's Seafood customer shipping label. You can easily edit how your shipping labels look via the Label Editor in entree. You can even change label formats depending on the type of item. 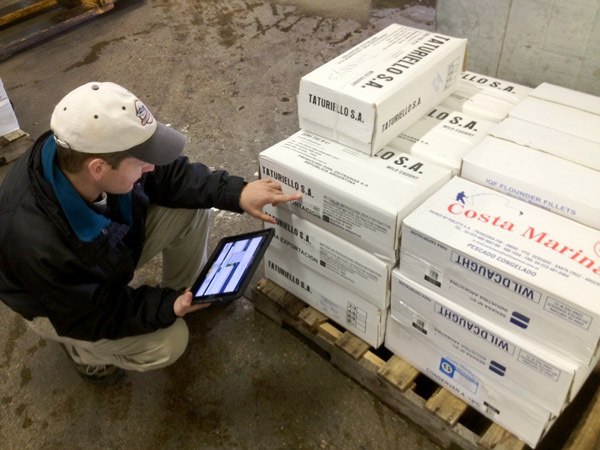 Gary John scrutinizes the carton weights on a pallet of frozen whiting fillet, prior to printing customer shipping labels and loading the pallet on a truck for shipment. Gary John checks the weight on a shipping carton, prior to printing a customer shipping label. Gary loves how ELS has eliminated human error in the entire warehouse operation. Gary says “ Orders are being processed twice as fast with ELS and has cut employee labor costs significantly. Employees are no longer waiting around because of an a inefficient (hand-written) order processing stream." 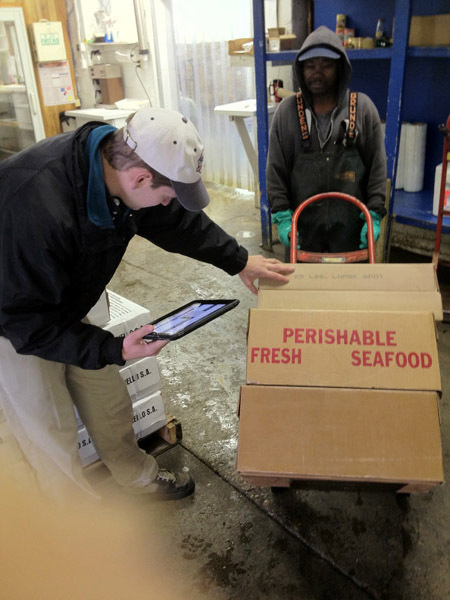 Because the WIFI zone at George's Seafood extends outside the warehouse, Gary John is able to check a customers order with his iPad in the parking lot, before the pallet is loaded onto the truck. 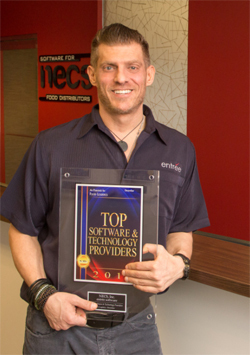 "Thank you NECS, the ELS Program has been a 'god send' for our company!"